Israel's investigation has revealed some 100 people infiltrated the peace and humanitarian aid activists making their way to Gaza, with the explicit design to attack Israeli soldiers using cold arms. 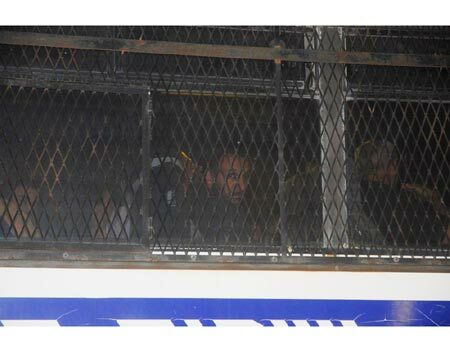 Nevertheless, it is clear that the majority were recruited by the same IHH handler who organized the flotilla. IHH is a Turkish humanitarian relief fund with a radical Islamic anti-Western orientation. Some of the suspects were found to be carrying large sums of money. Others had Kevlar vests and gas masks; and all were found to be carrying weapons such as knives, metal clubs and slingshots. Several of the suspected were wounded by IDF fire. Investigators have already concluded that this was the group that planned the violent resistance, which centered on the Marmara's top deck. Meanwhile, the Israel Navy has launched its own inquiry into the raid. Senior officers told yet events probably went awry when the commandos lost the element of surprise – especially in regards to the people waiting on the top deck. A senior IDF official said Tuesday night that "everything should be done in order to gather all the factual data and prove that the humanitarian sail had a semi-military body with a completely different goal." The officer added that the army was "working on it vigorously. We understand the importance not just for the Navy but for all of us." Addressing the foreign detainees suspected of beating up Navy fighters during the raid, the officer said, "If we manage to create a criminal case against some people, we should act against them in a proper legal manner." He denied reports that the IDF did not provide medical aid to the injured foreign activists. As for the next ship making its way to Gaza, the official said that the method of action would be determined after the lessons of the recent incident are drawn. The Captain of Turkish Ship "Marmara" Testifies: "I Tried to Stop the Preparation Two Hours Before IDF Boarded"